Tottenham came from behind to knock Championship leaders Nottingham Forest out of the Capital One Cup. After striking the bar in the first half through Ben Osborn, Forest took the lead after the break when Jorge Grant stroked in Lars Veldwijk's cross. 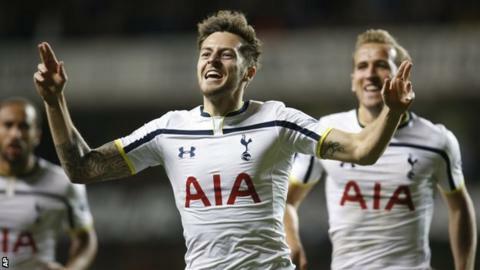 Spurs substitute Ryan Mason equalised with a long-range strike before Roberto Soldado deflected an Andros Townsend effort past Dorus de Vries. Harry Kane set up a last-16 home tie against Brighton with a sharp finish. Despite dominating possession, Spurs were made to work hard for their first victory in five matches by a spirited Forest side. To mark the 10th anniversary of the passing of their legendary manager Brian Clough, Forest fans in the away end at White Hart Lane wore replicas of his famous green round neck jumper. Tottenham, showing 11 changes from their 1-0 home defeat by West Brom at the weekend and captained by Aaron Lennon, went on the offensive from the start, only to see their attacks break down on the edge of the box. Forest were involved in little of the play, but made an explosive entry into the game midway through the half. Osborn won the ball into his own half, attacked the heart of the Tottenham defence and curled a left-footed shot that struck the underside of the bar. Tottenham's first clear-cut chance did not arrive until 10 minutes after half-time. Left-back Ben Davies swung over a cross from the left that found Paulinho, but the Brazilian's deft flick went past the post. Forest broke the deadlock against the run of play. Spurs failed to deal with a high ball, and Veldwijk's low cross deflected to Grant, who calmly found the net on his first senior start. Spurs boss Mauricio Pochettino responded by bringing on striker Kane and midfielder Mason, a 23-year-old who has had loan spells at five different clubs. Kane stung the palms of De Vries with a header before Mason fired in a spectacular equaliser. After teeing himself up from 25 yards, he struck a dipping, swerving effort into the top corner. Townsend, a constant menace, curled a free-kick onto the bar, and played a big part in the goal that put Tottenham ahead. His low shot from outside the area was heading wide before Soldado stuck out a boot to divert it over the despairing De Vries. Tottenham made victory certain in the final minute when substitute Eric Lamela slid a ball through to Kane, who drilled his shot into the far corner. "We always believed that we can come back into the game, always believed that it was possible to recover the result. "Now I am happy, happy for the players because it was a great effort. Never in doubt. "Going 1-0 down was difficult, but we got a great reaction, an important reaction for our supporters, who encouraged us and backed us. "It was great after the result. We won and I am happy for the players." "I think tactically we got it pretty much right. "I think the players - and when I say the players, the whole squad of players - attempt to please you in everything that we impart on them. "There was a lot of young players on the pitch for us tonight and I thought they did outstandingly well, as well as the senior ones that hadn't played a lot of football. "Tottenham will be more than pleased that they managed to get through in this competition and not get beaten at home again. They had a big scare." Match ends, Tottenham Hotspur 3, Nottingham Forest 1. Second Half ends, Tottenham Hotspur 3, Nottingham Forest 1. Erik Lamela (Tottenham Hotspur) hits the right post with a left footed shot from outside the box. Assisted by Ryan Mason. Stephen McLaughlin (Nottingham Forest) wins a free kick in the defensive half. Goal! Tottenham Hotspur 3, Nottingham Forest 1. Harry Kane (Tottenham Hotspur) right footed shot from the right side of the box to the bottom left corner. Assisted by Erik Lamela with a through ball. Substitution, Nottingham Forest. Oliver Burke replaces Jorge Grant. Attempt saved. Kyle Naughton (Tottenham Hotspur) right footed shot from more than 35 yards is saved in the bottom right corner. Assisted by Ryan Mason. Substitution, Tottenham Hotspur. Erik Lamela replaces Roberto Soldado. Goal! Tottenham Hotspur 2, Nottingham Forest 1. Roberto Soldado (Tottenham Hotspur) right footed shot from the centre of the box to the high centre of the goal. Assisted by Andros Townsend. Attempt missed. Andros Townsend (Tottenham Hotspur) left footed shot from outside the box misses to the right. Assisted by Ryan Mason. Corner, Tottenham Hotspur. Conceded by Daniel Fox. Attempt missed. Nabil Bentaleb (Tottenham Hotspur) left footed shot from outside the box is high and wide to the left. Assisted by Ryan Mason. Attempt blocked. Andros Townsend (Tottenham Hotspur) left footed shot from outside the box is blocked. Assisted by Roberto Soldado. Attempt missed. Ryan Mason (Tottenham Hotspur) left footed shot from outside the box is close, but misses to the right. Assisted by Harry Kane. Andros Townsend (Tottenham Hotspur) hits the bar with a left footed shot from outside the box from a direct free kick. Dangerous play by Jamaal Lascelles (Nottingham Forest). Substitution, Nottingham Forest. Dexter Blackstock replaces Lars Veldwijk. Goal! Tottenham Hotspur 1, Nottingham Forest 1. Ryan Mason (Tottenham Hotspur) right footed shot from more than 35 yards to the top left corner. Assisted by Ben Davies. Attempt blocked. Jan Vertonghen (Tottenham Hotspur) left footed shot from outside the box is blocked. Assisted by Ryan Mason. Corner, Tottenham Hotspur. Conceded by Kelvin Wilson. Substitution, Tottenham Hotspur. Ryan Mason replaces Benjamin Stambouli. Substitution, Tottenham Hotspur. Harry Kane replaces Paulinho. Attempt missed. Paulinho (Tottenham Hotspur) header from the centre of the box misses to the left. Assisted by Kyle Naughton with a cross. Goal! Tottenham Hotspur 0, Nottingham Forest 1. Jorge Grant (Nottingham Forest) right footed shot from the centre of the box to the bottom left corner. Assisted by Stephen McLaughlin. Attempt blocked. Stephen McLaughlin (Nottingham Forest) left footed shot from outside the box is blocked. Assisted by Lars Veldwijk with a headed pass. Corner, Nottingham Forest. Conceded by Jan Vertonghen. Attempt blocked. Lars Veldwijk (Nottingham Forest) header from the centre of the box is blocked. Assisted by Jamie Paterson with a cross. Attempt missed. Paulinho (Tottenham Hotspur) right footed shot from the centre of the box is close, but misses to the right. Assisted by Ben Davies with a cross. Attempt missed. Ben Osborn (Nottingham Forest) left footed shot from outside the box misses to the right. Assisted by Lars Veldwijk. Second Half begins Tottenham Hotspur 0, Nottingham Forest 0. Substitution, Nottingham Forest. Robert Tesche replaces David Vaughan. First Half ends, Tottenham Hotspur 0, Nottingham Forest 0.